Grammy Coverage: I love albums that take us on a trip back in time. All it takes is the beat of a drum and flute, and suddenly you feel part of something deep spiritual. 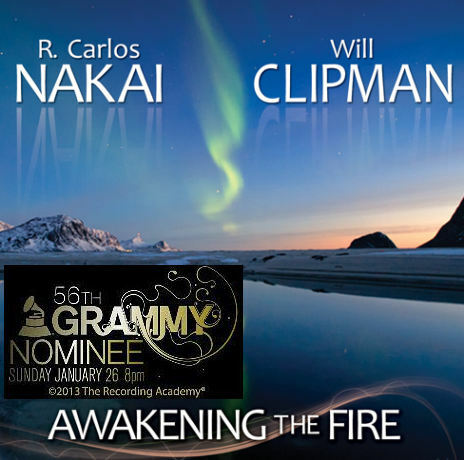 Grammy nominated album Awakening the Fire by R. Carlos Nakai and Will Clipman has this quality. Just close your eyes, and you’ll feel the warmth of an ancestral fire. You just feel like moving, dancing, to a magical beat. In our modern lives we are all experts in finding ways to live even more busy and hectic. We have to do something all the time, or we feel that we are standing still. Slowing down is not an alternative though. That’s why it is important to find effective ways to relax, and listening to New Age music may be one of them. An album like Awakening the Fire has so much to offer. Just listening to its feels like meditation. My favorite albums by R. Carlos Nakai are Earth Spirit (1987) and Winds of Devotion (1999), which are great for meditation. Firstly, Awakening the Fire has an interesting sound. In terms of mastering, the drums are very loud and many times overpowers the gentle flute. That is actually a nice effect, since the drums not only hold the rhythm – but is like a shamanic tool. It has a very hypnotic quality. Just close your eyes, and you’ll feel the warmth of an ancestral fire. You just feel like moving, dancing, to a magical beat. The flute melody is usually great, though not perfect. It follows the drum beat, not the other way around. The best songs are Oasis and Kindling the Essence, while the songs Standing Stones and The Fountain seem a bit chaotic. Awakening the Fire is one of R. Carlos Nakai’s best albums. I’m sure this is not the last album he and Will Clipman work together on. The album is highly recommended. Score: 89/100 – See how I rate music here.